True to life issues and hard-hitting reality have never been a stranger to the Hollywood treatment. Neither have Young Adult novel adaptations. So naturally a best seller that combines both was destined for the film treatment. The Hate U Give examines the ripple effects of a truly traumatic event has on relationships, one’s psyche, and the community itself. Starr Carter (Amandla Stenberg) is constantly switching between two worlds — the poor, mostly black neighborhood where she lives and the wealthy, mostly white prep school that she attends. The uneasy balance between these worlds is soon shattered when she witnesses the fatal shooting of her childhood best friend at the hands of a police officer. Facing pressure from all sides of the community, Starr must find her voice and decide to stand up for what’s right. 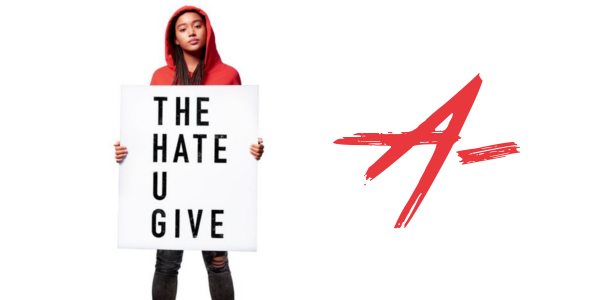 The strength of The Hate U Give lies beyond one particular element, but two performances are deserving of every ounce of praise that can be provided. First and foremost, Amandla Stenberg is a star in the making, and this just might push her over the top. Likely known by most for her role as Rue in The Hunger Games, Stenberg has quietly turned out good performances and has emerged from The Hate U Give with a potential awards campaign. However, the most memorable piece of The Hate U Give by far is Russell Hornsby. Powerful and vulnerable at the same time, Hornsby delivers a moving performance that is bound to make even the most cynical among us well up. If the studio plays their cards right, Hornsby will be a contender once nominations begin to pop up. The relevant material of the story cuts deep, drawing upon visuals from reality to inform the themes of its narrative. With an inciting incident that is expectedly seismic for the community, The Hate U Give never loses sight of the smaller details, the minute changes to Starr’s life after this traumatic event. The shifts from her life at home in Garden Heights to her life at the private school of Williamson function beyond the narrative cues to visual notes, with Garden Heights offering warmer, inviting colors, and Williamson being cold, distant and washed out. It isn’t a light subject material to adapt, but director George Tillman Jr. and writer Audrey Wells manage to craft something that handles a sensitive topic without drifting into melodrama or sweeping speeches. The focus is on Starr, it’s her story within this society of violence, and the focus drifts too far from just how powerful her voice and her place is in all of this. it is a film that mirrors reality and clearly has a message to deliver, but it never loses the humanity along the way. The Hate U Give is a thought-provoking and engaging look at the very real experiences of those on the receiving end of police brutality. Stenberg and Hornsby both emerge as some of the year’s best performances, with the latter hopefully getting some awards attention. The line between truth and fiction is thin, but the work from Tillman and Wells walks it perfectly for a final result that is easily one of the most impactful films of 2018.